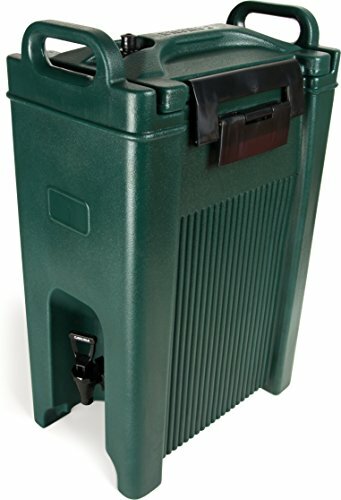 The Carlisle XT500008 5 gallon forest green beverage server is designed to keep beverages hot or cold more than 6 hours and can be used in a variety of food service applications. With wide latches on the side the beverage servers keep a secure seal while the spring action faucet controls dispensing for a no drip service. The easy grip contoured handles and arched base allow for containers to be stacked for a quick and easy transport. The beverage servers have a wide latch area for a secure seal and the latches have no sharp edges, won’t rust, bend, or dent like metal; latches are mounted into steel reinforcement plates for long life. Tight-fitting lids prevent leaks and provide increased heat retention. The beverage servers are BPA free and meet NSF international standards for use in food handling and processing.